I also have been using their products for a few years now and really love them. Their ingredients are the real deal- all natural and organic and not just marketed that way. I feel so comfortable knowing I can trust this brand when I use it. Footsie Fiesta. I’ve never been one to use foot lotion, but I was very impressed with this. The texture and smell is perfect for the feet, locking in moisture and helps to relax. 🌺The natural acids present in Hibiscus help to purify the skin by breaking down dead skin and increasing cell turnover & can help to control acne breakouts. I really loved @moonandbloom post from the other week. She is a Registered Herbalist. I share the same thoughts as her relating to ☀️. She recommends: “Exposing one’s eyes to the sun (safely in moderation) activates the pineal gland quite markedly, as we know from ancient practice of sun gazing. It’s so good for skin disorders and healing, and cleans & oxygenates the blood. Face: I used a sunscreen by Naturopathica for my face for the first time & loved it! On the Think Dirty app it is rated as a 1 out of 10 toxicity level. Body: I used a natural sunscreen I bought in Costa Rica and really like! See below for ingredients. 🔹Tonglen is a practice to awaken our compassion. Whenever we encounter suffering in any form, the tonglen instruction is the breathe it in with the wish that everyone can be free of pain. Whenever we encounter happiness in any form, the instruction is to breathe it out, send it out, with the wish that everyone could feel joy. It is a practice that allows people to feel less burdened, a practice that shows us how to love without conditions. Taz gave us a short homework exercise to do before next week’s class- to breathe in the pain/stress of someone we knew, then as we breathe out, to send happiness and joy their way. The class was from 5:30-6:30 for only $10. They also have $5, 30 minute classes during lunch and after work during weekdays. I really liked this class and definitely recommend. It was really nice to go to a class that incorporated learning about Buddhism, meditation as well as self reflection. I ate dinner at Divya’s Kitchen the other week with a friend. It is a Vegetarian Ayurvedic restaurant in the East Village and I couldn’t be more pleased with my experience! My friend and I both ordered lunch/dinner again from there within the next few nights. What does Ayurveda mean? It is the traditional Hindu system of medicine, which is based on the idea of balance in bodily systems and uses diet, herbal treatment, and yogic breathing. On the menu there were the words “Vata”, Balancing for Airy, “Pitta”, Balancing for Fiery, “Kapha” Balancing for Earthy, and “Tridoshic” Balancing for All. Next to each dish, would be one of these words. There are several ways to determine your body type. The most accurate is through the detailed history and physical by an Ayurvedic Physician. The owner, Divya Alter , studied Ayurveda in India. I was lucky enough to speak with her after my dinner. She is extremely knowledgeable and passionate, and has a beautiful blog with many recipes and an article that further explains Ayurvedic eating. You can check her website out here. She also offers Ayurvedic cooking classes above her restaurant that I am so eager to check out! Below is Seasonal Khichari, a grains and lentils stew with yellow mung, red lentils, quinoa, basmati rice, green beans, carrots, zucchini, kale, cilantro-mint chutney and sautéed leafy greens. This dish was so warming and filling but also light and I left feeling super nourished. They also have the most impressive tea selection I have ever seen! I would totally come here with a friend just to meet up for tea. Saturday I floated in a tank at Floating Lotus in Midtown Manhattan with hundreds of pounds of epsom salt for an hour with full sensory deprivation – no lights or sound. Before getting in, I put in ear plugs and then rinsed off in the shower. Then, I got into the tank, laid down and hit a button on the wall to shut the light off. When I first laid down in the water that is set to the same temperature as our body, I felt an irritation in the lower part of my back. I cracked my back and it was then fine. Apparently, its common for aches and pains to arise in the water and for our bodies to become more aware of them while floating. For a while after, my mind started racing about my plans for the rest of the day. I tried to calm it down by focusing on my breath. I do like meditating, but I usually meditate with a a guided meditation or a sound meditation with intense noise. I was told that flotation this has higher benefits and gets “easier” the more often you do it (like anything else, right?). When my hour was up, the light turned on. I got out and showered. There was a noticeable difference in my anxiety levels. I felt relatively anxious earlier that day and felt a noticeable difference in my mood after floating. I felt very calm and relaxed and ready for my day! How appealing does this Infrared Sauna look right now in this cold April New York weather? Have you ever heard of Color Therapy or Chromotherapy? Chromotherapy is used in NAO Wellness’s Infrared Saunas in order for users to reap benefits of both the sauna and chromotherapy at the same time. 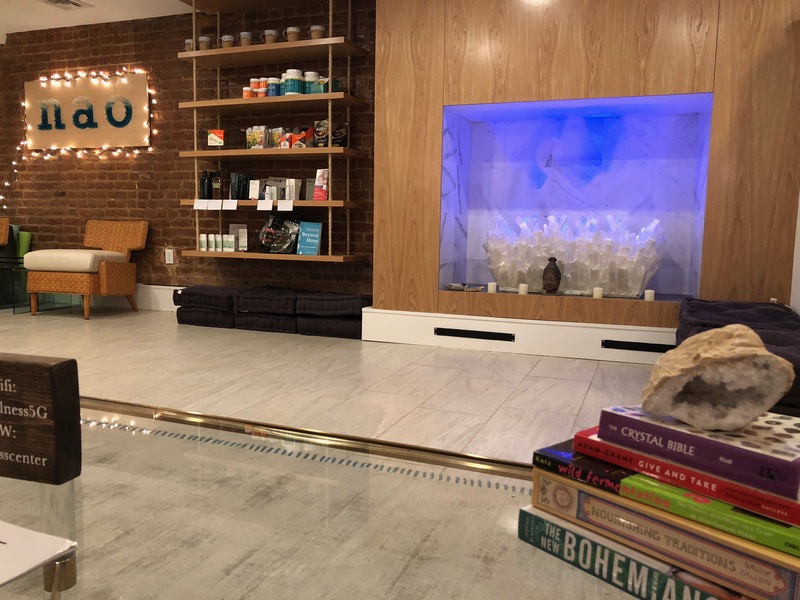 NAO Wellness is a wellness sanctuary located on a beautiful street in the West Village. They offer nutrition counseling and food intolerance testing, reiki, chiropractic care, host wellness workshops and events, have infrared saunas and are currently working on a room for sound healing and other holistic services. There are so many benefits of using an Infrared Sauna alone including detoxification, muscle and joint pain relief, increase of circulation, reduce inflammation, lowering of blood pressure, weight loss and skin purification. If you would like to learn more about the benefits of Infrared Saunas you can check out my previous post here. Chromotherapy is a method of treatment that uses the colors of electromagnetic radiation to cure diseases. It has health, emotional and cosmetic benefits. Ancient observation chromotherapy is a centuries-old concept. It was practiced in ancient Egypt, Greece, China and by the Mayans. The Egyptians utilized sunlight as well as color for healing. Color has been investigated as medicine since 2000 BC. Color psychology and medicine were substantially tested by Robert Gerard, Ph.D., of UCLA in the 1950’s. He analyzed the area of light, color and their psychophysiological imprints. He tested the reactions of the entire body with colored light beamed onto the skin of the subject. Gerard’s data showed that all colors affect the human both psychologically and physiologically. Warm colors: Warm colors showed a consistently pronounced pattern of stimulation. Warm colors helped those with reactive depression or neurasthenia. They increased muscle tone or blood pressure in hypertensive individuals. Exposure to warm colors increased respiratory movements, frequency of eye blinks, cortical activation and palmar conductance (arousal of the autonomic nervous system). Cool colors: Cool colors showed a consistent pattern of relaxation. Anxious subjects were calmed by these cooler colors, lowering blood pressure, providing relief from tension, alleviating muscle spasms and reducing eye blink frequency. They also proved to be an aid for insomnia. If you are interested in reading more about the specific light color benefits, check out the image below. In the sauna, you have the choice to choose a color to stick with or you can have the light system rotating automatically through each color during your session. Azeemi, Samina T. Yousuf, and Mohsin Raza. “A Critical Analysis of Chromotherapy and Its Scientific Evolution.” Evidence-Based Complementary and Alternative Medicine, vol. 2, no. 4, 2 Dec. 2005, pp. 481–488., doi:10.1093/ecam/neh137. NAO Wellness. “Infrared Sauna.” NAO Wellness, naowellness.com/. Why make your own nutmilk? Many store bought nut milk brands contain additives to prolong their shelf life and to help keep a consistent texture like carrageenan which is destructive to the digestive system and causes inflammation in your body. Carrageenan is hiding in many store bought nut milks, dairy-free ice creams and dairy products. For example, So Delicious is a popular brand in the dairy free world which has carrageenan in their nut milks and DF ice cream products. Its safer to make your own nut milk (and nice cream-link to nice cream recipes) to avoid consuming additives. Making your own nut milk has a creamier texture and tastes better. Just like juicing, there is leftover pulp after milking your own nuts. Another reason to make your own Nutmilk is that there are multiple uses for the leftover nut pulp, which I get into below. 1) Soak raw hazelnuts and vanilla bean (if using bean and not extract) in filtered water for 8 hours. 2) Discard soaking water. Rinse the hazelnuts and the vanilla bean. 3) Place soaked hazelnuts, honey, vanilla bean and 6 cups of water in a blender. Cover and blend on high for 1-2 minutes. It will be milky and have a bit of foam on the top. 4) Strain milk through a nut bag. I use Ellie‘s Best.They are good quality and BPA free. If you order from them, for 10% off, use Coupon Code: Deanna10 at checkout. They also have a free nut milk recipes E-book on their site. 5) Add raw cacao powder, cinnamon, banana to the Nutmilk and blend together. Note: I have seen people add the cacao/cinnamon before using the Nutmilk as well (in step 3). I do not recommend using the cheesecloth, strainer or any other method. These methods are messy and require multiple passes to strain out the bits. Also, it is not as creamy as when I use a good nut milk bag. What to do with leftover pulp? Check out my Instagram @dshamptonorganics for more. “Our Nut Milk Bag.” Ellie’s Best. N.p., n.d. Web. 08 Mar. 2017. Magnesium, calcium, sodium, and potassium are critical for proper cell-to-cell communication, so replenishing the skin with minerals can help restart the signaling processes that slow down with age. During the winter months, many of us struggle to get through the days which have a limited amount of sunlight and cold weather. The cold weather has a strong effect on our bodies. It tightens muscles, causes more muscle pain, muscle spasms, muscle knots, joint pain and less circulation. “A cold breeze blowing across an already-energy-deficient muscle will throw it into shortening, and shortened muscles can be a primary and key cause of pain,” says Jacob Teitelbaum, MD director of The Annapolis Center for Effective Chronic Fatigue Syndrome/Fibromyalgia Therapies. Also, changes in temperature or barometric pressure, a measure that refers to the weight of the surrounding air can trigger joint pain (Goodman). Below are some of my favorite methods I use to get through the cold winter months in New York. Biomat: A BioMat uses far infrared rays which penetrate deeply into the body and address imbalances at the cellular level. You can adjust the heat on the mat to your liking and then simply lay down on it. It feels as if you are being warmed up from the inside and is ideal on cold days. It can be used to help with a wide range of health issues, including relieving minor muscle pain, joint pain and stiffness, increasing blood circulation, reducing stress and more. Sauna: There are many benefits of using a sauna including detoxification, muscle and joint pain relief, increase of circulation, reduction of inflammation, lowering of blood pressure, weight loss and skin purification. “It causes you to sweat and can help release endorphins,” says David Geirer, MD, a sports medicine specialist in Charleston, South Carolina. “And the heat also increases blood flow to the muscle and the periphery of the body, which helps sore muscles feel better temporarily.” Physical therapist Patrick Walsh states that heat therapy is usually reserved for treating older injuries or chronic muscle or joint pain, like arthritis. (MacMillen). Stretching in the sauna gets a deeper stretch and muscles will loosen up quicker. It can be like a mini hot yoga class. Steam room: The steam room can help with winter congestion, colds and sinus infections. Breathe in the steam with eucalyptus essential oil on a towel to help with any type of respiratory infection. Hot Detox Bath. There are many types of detox baths that can be taken. My favorite in the winter time in order to relieve pain and muscle cramps is a hot epsom salt bath. It is great for detoxification and also good for after a hard workout. Epsom salt helps to detoxify your body by making you sweat out toxins. Also, you will absorb some of the minerals and trace minerals found in the salt such as magnesium. Stay in bath for 25-35 minutes and make sure to have a water bottle next to you to stay hydrated since the salt pulls out water from your body. Submerge your whole body up to your chin to receive the most benefits. Take the bath before bed time since it makes you tired, but make sure to shower after bathing to get off any excess sweat and bacteria. This bath can be taken one to two times a week and more once your body adjusts (Morrison 138). Essential Oil Diffuser: Essential Oil Diffusers provide an excellent method of calming and moisturizing to build a healthy, natural, warm, and pure living environment. Use eucalyptus essential oil to help with congestion, to control coughing, or to sooth a sore throat. This oil is perfect for boosting concentration and for keeping your energy level elevated. It is great for dark, cold or rainy winter days when extra stimulation is much needed. Heat Pads: Selective heating, also known as local hyperthermia, of affected joints with hot packs can be very beneficial in treating chronic aching and dysfunctional joints and muscles. The best type of heating pads are clay heating pads which is heated up in the microwave. Stay away from electrical heating pads because they expose you to Electromagnetic Fields also known as EMF (Storl 193). Hot tea: Cold fruit smoothies are refreshing on a hot summer day, but in the winter our bodies crave something warm. Consuming a hot drink will heat up your whole body. My favorite tea mix in the winter acts as a natural antibiotic. Whenever I feel like I am getting sick, my go-to tea remedy is a mix of raw manuka honey, black pepper, turmeric, coconut oil, ginger, lemon, apple cider vinegar, garlic, oregano. Also, warm water and lemon is easy to make with many health and detoxing benefits. Goodman, |. By Brenda. “Weather and Arthritis Pain.” Weather Pain | Weather Forecast and Pain. N.p., n.d. Web. 14 Jan. 2017. MacMillan, Amanda. “Do Saunas Help or Hurt Sore Muscles?” Outside Online. Outside Magazine, 06 Oct. 2016. Web. 09 Jan. 2017. Storl, Wolf-Dieter. Healing Lyme Disease Naturally: History, Analysis, and Treatments. Berkeley, CA: North Atlantic, 2010. Print.